The bFan® will help you sleep deeper and longer, it will help stop night sweats and get you the rest you deserve. The bFan® is quiet, gentle, stable and powerful when you need it. The bFan® is not sold on Amazon, Don't Be tricked. The bFan® is a simple fan that can be placed anywhere around your bed, preferably at the foot of the bed. The bFan® delivers a fully controllable gentle, quiet breeze between your sheets. 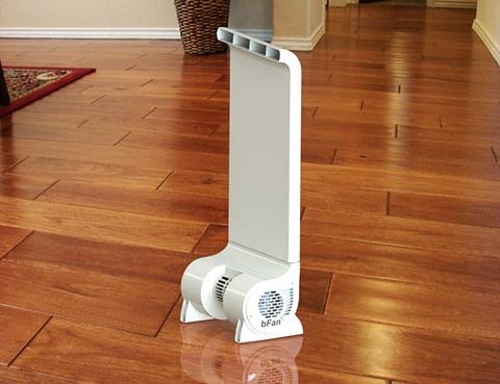 When placed at the foot of the bed the air from the bFan® will help keep you cool all night long. The fan is controlled by a remote that you will keep next to your bed, many people prefer to keep it under their pillow or on their nightstand. Anyone that has trouble sleeping at night due to over heating. Many people are sleep deprived for their body temperature fluctuates too much during the night. This temperature swing will cause you to awaken either slightly, or totally. These brief moments will keep you from moving into a deep REM sleep. This deep sleep is necessary for mental and physical rejuvenation. Without it you will be tired and groggy all of the time. Still there are other people that will find the bFan® a savior for their electric bill. If you would like to save on your air conditioning cost, you will find the bFan® to be a wonderful addition to your sleep environment. The bFan®’s innovative design removes the heat that is generated by your body which gets trapped inside your bed (your sheets, comforter, and mattress). This unique system enables you to sleep much cooler and deeper at night and save you money on air conditioning costs. The body will extend from 19” tall to 37” tall. The air duct is 12” wide and ¾” deep. The base is 6.25” tall X 7” deep and 12” wide. The base can be set in any direction, either under the bed or pointing outward from the bed. It can be place anywhere around the bed from the foot to the top and anywhere along the side of the bed. The bFan® is not sold on Amazon - Don't Be tricked. How the bFan® works video and the logic behind it. About 15 years ago we built our very first fan for the bed. We called it the Bedfan. We were the very first company to bring a product like this to the market place. For many years we developed our name and gained trust in the market for having a quality product and quality customer service. We built a good following and many people knew us as the Bedfan company. For the next two years we fought them with all the legal power that we could muster. We finally ended the struggle just before they filed for bankruptcy and sold all their assets to a company in China. Yet still to this day they confuse the market by using our brand name and hijacking our advertising. Increased the stability We were able to accomplish this with a balanced footing, lower center of gravity and a more robust blower motor. Our first design was slimmer and lighter, good but annoying when it would fall over. That was usually not a problem when installed at the foot of the Bed but became an issue when using it anywhere else. We have fixed that. Increased the overall air flow Although the original fan design was wonderful for its time, there was a desire by many people to have more air flow. By changing from an axial fan setup to a squirrel cage blower we were able to increase the air flow significantly. Yes the people that copied us are still using the old design as they did nothing to improve the design only change the look. Increased the fans total static pressure. Static pressure is really what makes this all happen. When we built our first units many years ago we aimed at the highest static pressure we could obtain with an axial fan. 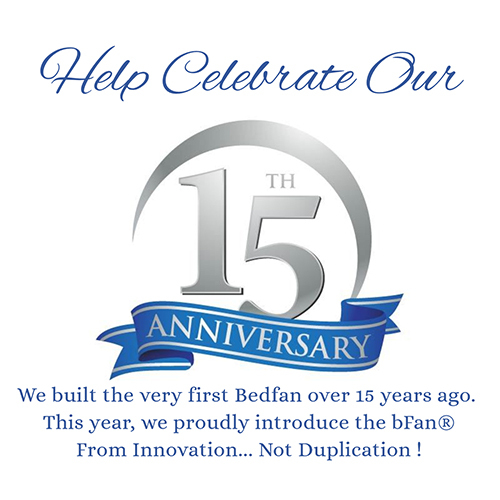 When we started to develop the new bFan® we wanted to take it to the next limit and this is why we switched to a squirrel cage fan. The static pressure on the new bFan® is so high that it is capable of lifting your sheets and comforter while even on low. Static pressure is the ability for the fan to push the air past resistance. The higher the static pressure the more air flow you get. Needless to say, that other company, well they are still using low static pressure fans. Made the fan much quieter and much stronger This is a direct result of moving to a squirrel cage blower. This fan is much more efficient than any axial fan, like that other company uses. The fact that it is able to move more air at a much lower speed results in an overall very quiet system. Like i have said, the old style axial fans worked well for their time but people wanted quieter, and we have delivered. 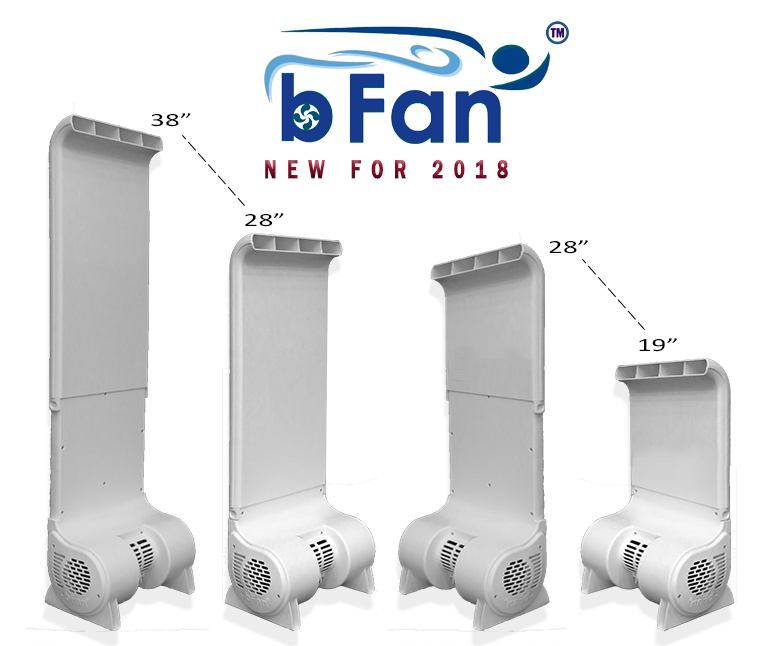 The installation of the bFan® is very simple. In this next video we will show you just how simple it is. For this installation we installed the bFan® at the foot of the bed, which is the preferred location. From the foot of the bed the air will naturally travel along your body and exit at the top of the bed around your shoulders. See the following full video for installation instructions. 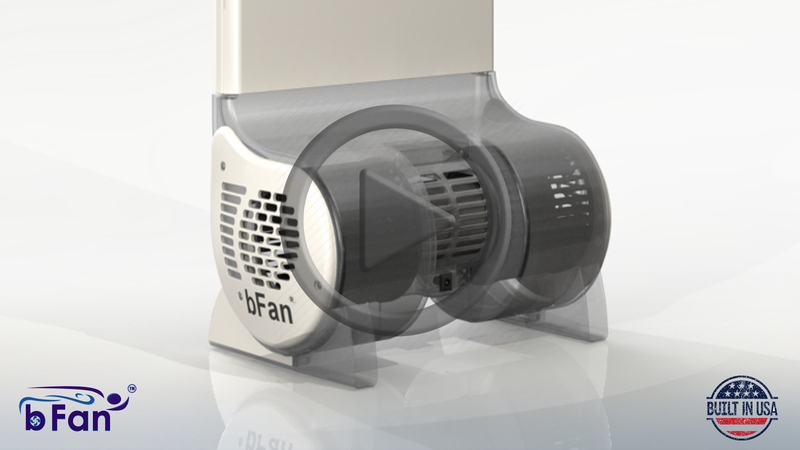 The bFan® is fully controllable from off to high and all points in between. 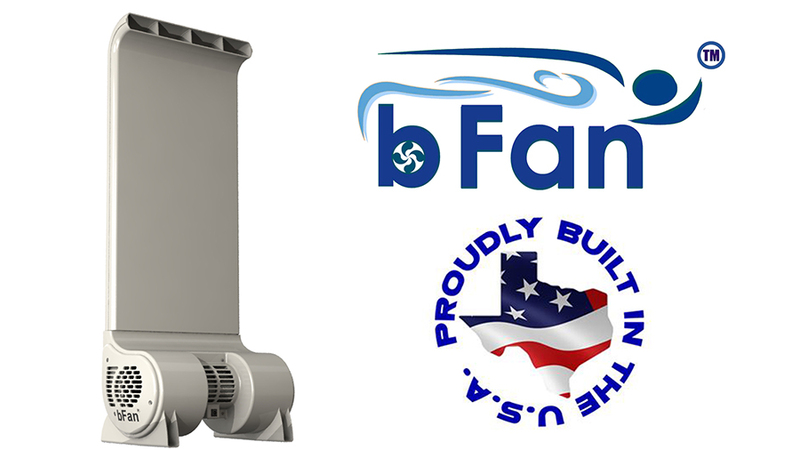 When you first start using the bFan® you should start with the bFan® on low and gradually work your way up. At the same time you will raise the temperature in your room by a couple degrees each night. The objective is to bring the fan to about half of full power yet still feel cool. After a few nights of doing this you will reach a point of comfort that you have never felt before. This is equilibrium and from this point you can stop changing the thermostat and start sleeping deeper and sounder. For the first night, set the fan on low and see if it is too cool in bed for you. If your bed is too cool, you need to raise the temperature in your room for the next night. Follow this pattern until you have reached about half power on the fan and you are no longer too cool. The point of equilibrium is the point at which the bFan® is evacuating your body heat at about the same rate that it is being created. Above equilibrium will be too cool and below equilibrium will be too warm. By adjusting the thermostat in your house a few degrees at a time, along with adjusting the bFan® speed, you will eventually find that you are significantly reducing the amount of electricity being consumed thus lowering your electric bill at the same time.